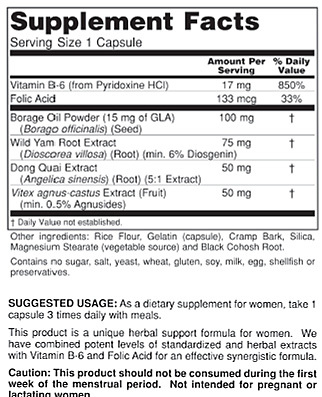 Suggested Use: As a dietary supplement for women, take 1 capsule 3 times daily with meals. We recommend taking a multiple mineral and 400-1000 IU natural vitamin E to complement Female Balance. Other Ingredients: Black Cohosh, cramp bark, rice flour, silicon dioxide and magnesium stearate. Warnings: This product should not be consumed during the first week of the menstrual period. Not intended for pregnant or lactating women.